A team of cyclists from Lockerbie, Scotland, will arrive at Syracuse University on Thursday, Nov. 1, completing a 3,238-mile journey in honor of the victims of Pan Am 103. 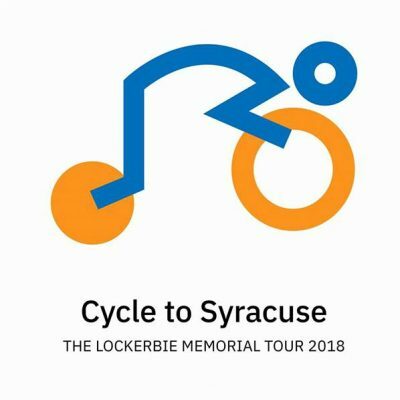 The Cycle to Syracuse team will arrive on the Einhorn Family Walk in front of the Goldstein Alumni and Faculty Center at 3 p.m. Bagpipers will lead the cyclists up the walk to the front of the Schine Student Center, where a brief program will be held. Members of the University community are invited and encouraged to attend and welcome the cyclists. The Cycle to Syracuse team is composed of five cyclists. Four are first responders: Colin Dorrance, representing Police Scotland; David Walpole, representing the Scottish Ambulance service; David Whalley, representing the Royal Air Force Mountain Rescue; and Paul Rae, representing the Scottish Fire and Rescue. The fifth cyclist, Brian Asher, is the head teacher of Lockerbie Academy. The school shares a strong bond with Syracuse University, and is the school from which come the Lockerbie-Syracuse Scholars, who study at the University each year. In addition to honoring the victims, the ride is intended to raise awareness of emergency services and mental health issues. The ride has been completed in three stages. Students at Lockerbie Academy and surrounding primary schools rode exercise bikes or their own bikes at their local school throughout September and October, culminating in a final event at Lockerbie Academy on Oct. 10. For the next stage, a 70-mile cycle ride from the memorial cairn at Lockerbie Academy to Edinburgh Castle took place on Oct. 13. In the final stage, team members are cycling more than 600 miles from Washington, D.C., to Syracuse, arriving in time to participate in Syracuse University’s Annual Rose-Laying Ceremony to honor the 270 victims of Pan Am 103, including 35 SU students, lost on Dec. 21, 1988. After a day of rest, the team was sent off from Lubin House, SU’s home in New York City, early in the morning of Oct. 30 by Dan French, University senior vice president and general counsel, and Secretary of State for Scotland David Mundell. Laura Beachy, a 2011-12 Remembrance Scholar, led the cyclists out of the greater New York area. More information on the memorial ride can be found at cycletosyracuse.com.